Tyrannosaurus rex on display at the American Museum of Natural History. Barnum Brown was arguably the greatest fossil hunter of all time. Working for the American Museum of Natural History in New York, he had a career spanning more than 60 years. The museum boasts the largest collection of fossil dinosaurs in the world, thanks in large part to Brown’s collection efforts. Mr. Bones, as he was affectionately known by admirers, had his discoveries plastered on the front page of newspapers across the country and had been on so many radio programs and given so many lectures that he was considered one of the most famous scientists in the world during the first half of the twentieth century. Brown embarked on the month-long sail to Punta Arenas, during which he was so taken with sea sickness that he was “…first hoping I would die, then afraid I wouldn’t”. He managed to survive the journey, and collected fossils for the next year and a half. 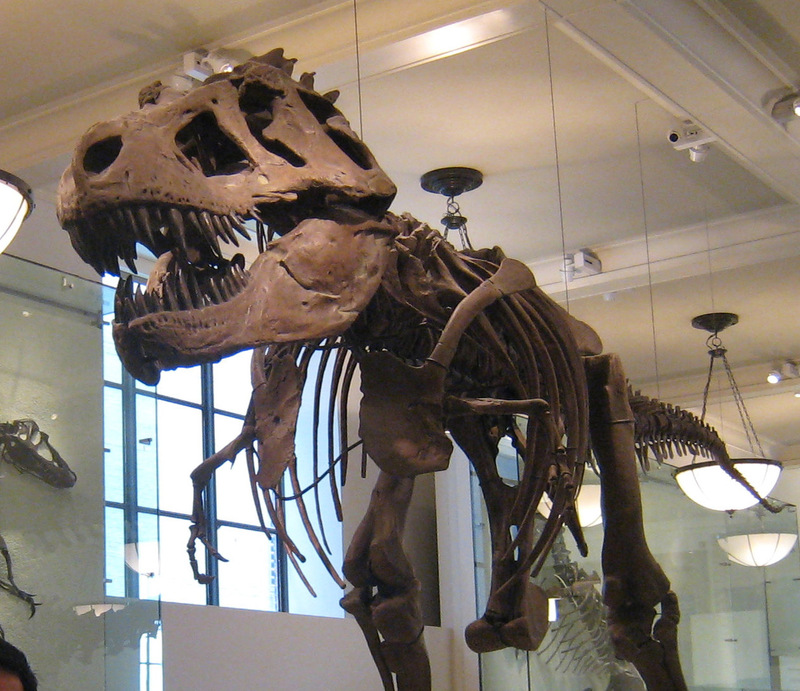 Months would pass without word and at times the only evidence of Brown’s continued survival would be the shipment of tons of fossils back to the museum. Mr. Bones would face blizzards, evade quicksand, and even survive being shipwrecked near Tierra del Fuego before heading home. Brown’s greatest discovery came in 1902. Brown and his team had been sent to the badlands of Montana to search through the Cretaceous rock beds of Hell Creek for Triceratops fossils, in particular an intact skull. This rugged terrain was explored by Louis and Clark and is known as the Missouri Breaks today. After supplying themselves at Miles City, Montana, they traveled by wagon for five days to Hell Creek where they made camp at the base of Mount Sheba. Before dinner on the first night, Brown found bone fragments that had fallen down the hill into the creek. After tracing them up the hillside to their point of origin, they started digging, first with plows and scrapers to remove the overlying sediment, then with dynamite when the sandstone became too hard. It would take two years to excavate, and in the end they left a hole that was nine meters long, nine meters wide and six meters deep. The surrounding rock was so hard that they removed everything in large stone blocks which were transported, first by wagon, then by train, back to the museum. The pelvis was massive—it’s block weighed over two tons and was too big to put on a wagon. Brown had to build a sled and drag it with a team of horses the 200 km back to Miles City. It turns out he had discovered the type specimen of Tyrannosaurus rex. A few years later, Brown would return to Hell Creek and discover another, even more perfectly preserved Tyrannosaurus rex which would allow the museum to fully characterize the dinosaur that has captured the imagination of so many in the hundred plus years since its discovery. 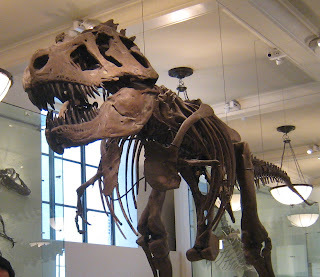 This “favorite child” of Mr. Bones is still on display in the Museum’s Fossil Hall and speaks volumes about the incredible power of Tyrannosaurus rex, one of the largest carnivores to ever walk the planet.